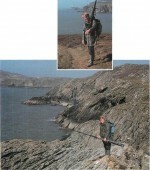 Wales abounds with reservoirs well-stocked with brown and rainbow trout. Managed on a put-and-take basis, they are frequently restocked and yield well. 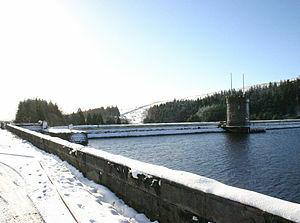 Pontsticill Reservoir in Glamorgan, for example, has produced trout to 14 lb. 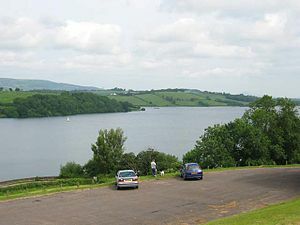 In Glamorgan, the reservoirs Ystradfellte, Beacons, Cantref, Llwyn-on, Upper and Lower Neuadd, Dol-y-Gaer, Pontsticill and Talybont lie in the area north of Merthyr Tydfil and are easily approached by the A465, the A470 and the A4059. The Welsh Water Authority (WWA) will give a map of the area when issuing licences and permits, and also issue an annual rover ticket costing £75 for a Class 1 permit that covers 22 of the Welsh reservoirs, including Llwyn-on, Upper Neuadd, Cantref, Dol-y-Gaer, Beacons, Pontsticill and Ystradfellte, Class 2 permit £50, Class 3 permit £25, Class 4 permit £10, which permits fishing in the Ponsticill, Beacons and Ystradfellte reservoirs only. 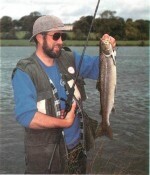 The reservoirs Llanishen and Lisvane hold quality trout and can be fished on a season permit costing £85. Day fishing is available for Pontsticill (253 acres) on a day ticket costing £2; Ystradfellte (59 acres) for £2; Beacons Reservoir (52 acres) for £3; and Dol-y-Gaer (96 acres) and Cantref Reservoir, both costing £3 per day. Day tickets for Llwyn-on (150 acres) cost £3.50 and the Upper and Lower Neudd (57 and 12 acres) £3.50 and £6 respectively (juniors and OAPs half-price). Fishing at these reservoirs is good. Each is stocked with trout of 12in average, except Ystradfellte which has natural brown trout. Talybont Reservoir (318 acres) is controlled by the Usk Water Division of the WWA, and may be fished with day or season tickets issued on site. Spinning is allowed from one bank from June to the end of the season, and boats are available. In the Upper Severn area, there are two reservoirs owned by the Severn-Trent Water Authority. Llyn Clywedog (600 acres) is reached via the A483 from Welshpool and then the B5518 out of Llanidloes. 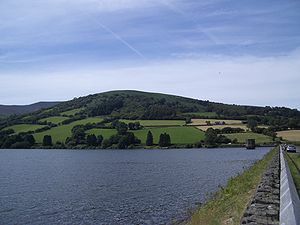 Vyrnwy Reservoir (1,121 acres) is reached by the B4393. Both are restocked with brown and rainbow trout. At Vyrnwy fly fishing is allowed from boats only. Tickets are obtainable from the Lake Vyrnwy Hotel, Oswestry, Shropshire, SY10 0LY. At Llyn Clywedog Reservoir tickets cost £2.80 (day), £15 (week) and £32.50 (season). In South West Wales, Dinas Reservoir and Nant-y-Moch Lake are both controlled by the Central Electricity Generating Board, (CEGB) North Western Region, and Llys-y-Fran controlled by the WWA. Dinas (60 acres) and Nant-y-Moch (860 acres) are both off the A44 Aberystwyth to Llangurig road, one and four miles out of Ponterwyd village respectively. At Dinas Reservoir fly and worm fishing and spinning are allowed from the banks but fly fishing only from the boats; at Nant-y-Moch fly fishing only is allowed. Provision is made for disabled anglers at Dinas reservoir, access being through a gate on the west side. Day tickets for Dinas cost £3.20 adults, £2 juniors, OAPs and the disabled. Day tickets for Nant-y-Moch £1, season £11. Permits obtainable from Evan’s Garage in Ponterwyd, or from the CEGB. The Llys-y-Fran Reservoir (187 acres) is north east of Haverfordwest reached by the B4329. Day tickets at £3 for a six fish limit (half price for juniors and OAPs). It is stocked with brown and rainbow trout, has four boats available and allows fly and worm fishing and spinning. There are rowing boats at £5 (day) and £2.50 (part da}’). Permits are available from the Superintendent of the Pembroke Water Division or from the kiosk at the reservoir itself. The Snowdonia area Gvynedd, containing most of the Snowdonia National Park, has two reservoirs; Tan-3r-Grisiau, north of Blaenau Ffestiniog on the B4414, and Trawsfynydd Reservoir south of Ffestiniog on the A470. Tan-y-Grisiau is a 95 acre artificial lake, now controlled by the Pyrsor Angling Association. It is stocked with rainbow trout. Spinning is allowed, but groundbaiting and swimfeeders are strictly prohibited. Wading is also forbidden because of the regular fluctuation of the water level caused by the power station. When buying tickets at the Reception Centre it is advisable to ask which stretch is best to fish as rainbow trout tend to shoal. Tickets cost £3.45 weekdays, £2 juniors, OAPs and disabled, weekends and Bank Holidays £4 adults, £2.40 juniors, OAPs and disabled. Trawsfynydd Lake (1200 acres) is owned by the CEGB and managed by the Trawsfynydd Lake Management Committee. It is south of Ffestiniog and reached via the A487. Ticket details from H Lewis, Newsagent at Blaenau Ffestiniog, Gwynedd, or Davies Fishing Tackle, Lord St, Blaenau Ffestiniog. In Clwyd, the 368-acre Alwen Reservoir is owned by the WWA and controlled by the North West Water Authority. It is reached by the B4501 south west of Denbigh. In the top section, only fly fishing and four rods per side of the reservoir are allowed, with floatbait and lure forbidden. In the middle and lower sections fly fishing and spinning are permitted. In all sections of the reservoir groundbait and maggot are prohibited, as is match and com- petition fishing. Day – at £1.60 – and season tickets are available from the Superintendent’s Office at the reservoir. Llyn Celyn (800 acres) owned by the WWA, is west of Bala on the A4212. Restocking with brown and rainbow trout is frequent. Other than a section reserved for fly fishing, spinning and worm are allowed. Tickets costing £2.30 (day) are available from the Post Office in Fron-goch, or from W E Pugh’s tackle shop in Bala. There is a limit of six fish per day per angler at both Llyn Celyn and Alwen. In Gwent, Llandegfedd Reservoir (429 acres) owned by the WWA, is reached via the A4042 south of Pon-typool. The reservoir is stocked with brown and rainbow trout, and restocking is on a monthly basis. Rowing boats are available at a cost of £5 per day, £2 after 4 pm, and motor boats £10 (day) and £5 (after 4 pm). Day tickets cost £3.50, weekly and season tickets are also available (reduced rates for juniors and OAPs) from Sluvad Treatment Works, Panteg, Pontypool, or day tickets from the kiosk at the reservoir. Fly fishing only is allowed. Ynysfro, approximately one mile north of Newport, is owned by the WWA and consists of two reservoirs, Upper and Lower, of 10 and 16 acres respectively. Details of fishing times may be obtained from the WWA Usk Water Division, Station Buildings, Newport, Gwent, as may season tickets. Day tickets at £3 (half-price for juniors and OAPs) can be bought from the Reservoir Superintendent. Elan Estate Office, Elan Village, Rhayader, or from Mrs Hills, ‘Kingsfield’, Elan Valley. 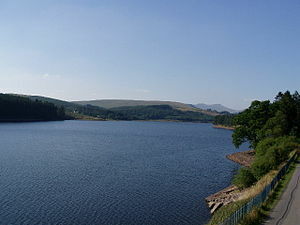 For these reservoirs, as for all other Welsh reservoirs, it is ad-visable to check fishing dates and local regulations with the controll-ing authority. 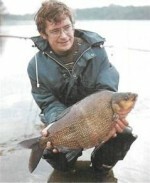 Each reservoir has its particular bag and size limits, and also certain times of the year when fishing is best. Season tickets can be obtained from the addresses given or from the WWA office for that area, or from local tackle dealers. As some reservoirs are small or are extremely popular, it is advisable to buy tickets in advance. Pen Maen-wern/V*. ^A, D OL-Y-MYNAC and rainbow trout, 10 boats are available. Day tickets cost £3.50; after 5 pm an evening’s fishing costs £2.50. These, as well as weekly and season tickets can be obtained from the Fishing Office, Llyn Alaw, Llanerchymedd, Anglesey, or in advance from the WWA, Gwynedd Water Division. The Elan Valley Lakes, owned by the WWA and west of Rhayader on the B4518, are probably the most popular and well-known reservoirs in Wales. The group consists of three lakes – Cerrig Llwydion, Llyn Carn and Llyn Gynin – and six reservoirs – Caban Coch (2170 acres), Dol-y-Mynach (40 acres), Garreg-Ddu (200 acres), Pen-y-Garreg (124 acres), Claerwen (650 acres) and Craig Goch (217 acres). The last two, and Dol-y-Mynach have brown trout which occur naturally, but the other reservoirs are restocked throughout the year. Groundbaiting and bubble floats are strictly prohibited, and fly fishing only is allowed on all reservoirs except Craig Goch where spinning is also permitted. On Caban Coch, Claerwen and Pen-y-Garreg rowing boats are available. Tickets for all waters cost £2.50 per day (half-price for juniors and OAPs).